Spurred by the Hudson Yards/Hell’s Kitchen Alliance BID, Manhattan Community Board 4 is pressing for a protected bike lane and pedestrian islands on 10th Avenue. On Monday the board’s transportation committee voted unanimously to recommend a northbound protected bikeway on the west side of 10th Avenue from 14th Street to 55th Street — nearly the entire length of the district. 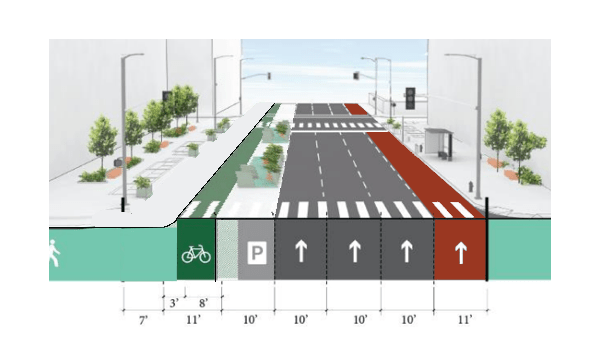 The idea originated with the BID, which hired Sam Schwartz Engineering to produce the street redesign concept [PDF] as part of a streetscape study for the area between 34th Street and 42nd Street, transportation committee co-chair Christine Berthet told Streetsblog. With development around Hudson Yards slated to bring thousands of people and jobs to the far West Side of Manhattan, there’s even more reason to redesign the neighborhood’s highway-like avenues for safe walking and biking. With pedestrian islands, the typical crossing distance would shrink from 69 feet to 51 feet, an improvement of more than 25 percent. The committee recommended that DOT implement the redesign between 14th and 55th Streets, prioritizing the blocks between 34th and 42nd. Board members also want to see the city incorporate protected intersections. “It is an illustration of what is feasible with current DOT guidelines,” said Berthet. In addition to the immediate safety benefits for people walking and biking on the West Side, getting a protected bike lane on 10th Avenue would have a big impact on the Manhattan bike network. It would generate momentum to link up with the Amsterdam Avenue protected bike lane, which currently doesn’t extend below 72nd Street, forming a north-south pair with Ninth Avenue/Columbus Avenue and relieving some of the crowding on the Hudson River Greenway. 10th Av is awful; anything is an improvement, but do we really need FIVE ten-foot lanes? Fantastic! Why stop at 34th & 42nd streets? I agree. Without expanding the sidewalks, people will be more inclined to walk into the bike lane. Maybe they should just shift the bike and parking lanes over to the right 10 feet and extend the sidewalk space? Missing: specific treatment between 39th and 41st Streets where there’s heavy west-turning motor traffic heading to the Lincoln Tunnel. I’m not raining on the bike-lane-on-10th-Av parade. This is similar to 8th Av between 40th and 43rd Streets, but without the intense pedestrian activity. As long as a Consultant (expert?) is involved, I’d like to see specific improvements addressing specific situations. This generic proposal is unusable on 10th Av in the upper 30’s to 41st St.
Then all we need is some cross town dual directional bike lanes on 13th, 27th, 39th and 57th street. 13th is already happening I think. You really like to pass on the inside (to prove a point?). But I think this movie (and I glanced at a couple others) is the false sense of security in a parking protected bike lane (PPBL). An important concept of the Vision Zero Initiative (not the Mayor’s watered-down joke) is to account for motorist err and iron them out through engineering and design. For example, the parking protected bike lane is a system relying on faith, rather than steel bollards or plants or something to enforce vehicles not to trespass into the cycling lane. The threat of car doors opening, cars pulling into the curb, or poor parking jobs shouldn’t be in the picture if the PPBL was designed to prevent this in the first place. And mixing zones should be eliminated altogether, NYC DOT will make up excuses out of nowhere for not implementing it. Blocking the Box is one thing, but NYC DOT is not doing enough to minimize the left hook threat and dragging their feet. Politics shouldn’t be interfering with roadway design and traffic safety. That leaves Blocking the Box, jaywalkers and wrong-way cyclists, which are the lesser, more tolerable evils. However, I don’t expect high hopes with this mayoralty and this DOT to even address the first point I mentioned. Just more lip service and political child’s play. If nothing else the video vividly illustrates how protected bike lanes fail on the travel time front. The city did absolutely nothing to either remove or retime traffic signals. End result is hitting red lights every two or three blocks. Such infrastructure would get a big red F in the Netherlands just for that reason alone. And then you have the other things you mention. 20 minutes to go 40 blocks on bike is just ridiculous. Even a granny in the Netherlands can do that in half the time. The Manhattan Community Board 4 transportation committee endorsed the projects unanimously. DOT reps attributed the absence of concrete to a shortage of resources. Community boards and the public will weigh in on important bike projects in Manhattan and Queens tonight.